You already know how the world ends. You’ve seen it a thousand times; it drowns or burns, it starves or withers under the ominous hand of disease. From the biblical tale of Noah’s Ark to The Twilight Zone and beyond, if there’s one looming eventuality we’ve accepted, it’s the apocalypse. With warnings unheeded and consequences disregarded, the cataclysm strikes—be it climate change, super viruses, or nuclear annihilation, to name a few bone-chillingly realistic examples. We’ve run the scenarios and watched countless versions of society crumble. Maybe we turn bandit or cannibal, but what remains is humanity’s primordial tendency toward division. Even in the apocalypse, classes form: the strong and the weak, those with power lording over those without. Some manage to hoard resources and get fat while others scavenge for crumbs. In some ways, eking out a post-apocalyptic existence doesn’t seem all that different from the way the world has always been. How different would that destitute world sound to a 19th-century chimney sweep? 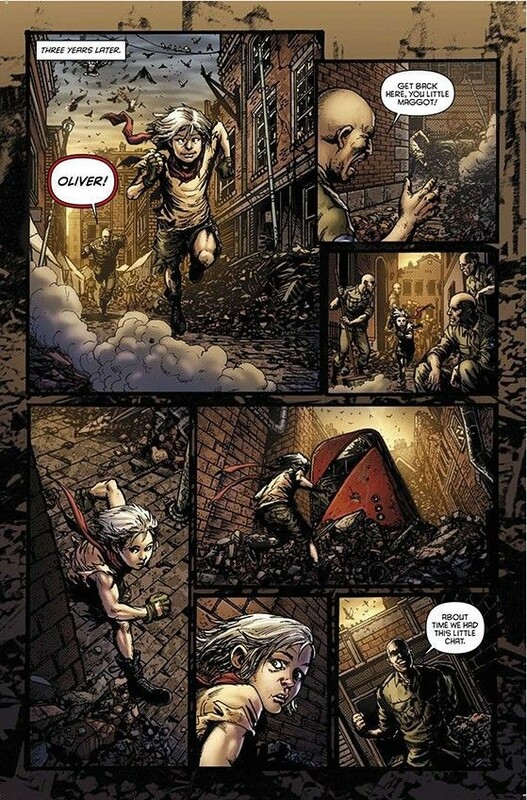 Oliver, a new series from writer Gary Whitta and artist Darick Robertson, imagines Charles Dickens’ famous orphan, Oliver Twist, in the wreckage of a post-World War III London. While it’s a sci-fi remix of a literary classic, the creative team—including colorist Diego Rodriguez and letterer Simon Bowland—maintains a clear focus on the human proclivity for marginalization and social stratification. For the writer, who previously wrote screenplays for The Book of Eli and Rogue One: A Star Wars Story, part of the fun lies in exhibiting the ills of a Dickensian London through a futuristic lens. During the aforementioned war in Oliver, the military manufactures an entire army of clones, but a never-ending supply of soldiers means endless war, prompting nuclear devastation. With no perceived use after the war, and having been genetically engineered to withstand radiation, chemical, and biological weapons, these soldiers are forced to inhabit the ruined cities that conventional humanity can no longer inhabit. This is the world in which Oliver comes of age, raised by the one-eyed veteran and medic Prospero (all of the soldiers take their names from the works of Shakespeare). “Maybe there’s a little bit of commentary there about how we should treat our veterans better than we do,” Whitta adds. Robertson’s visual depictions of London rival the tragic scenery of any classic World War II movie. Piles of bricks and fallen spires form the jagged skyline, including the famous London Eye toppled over. 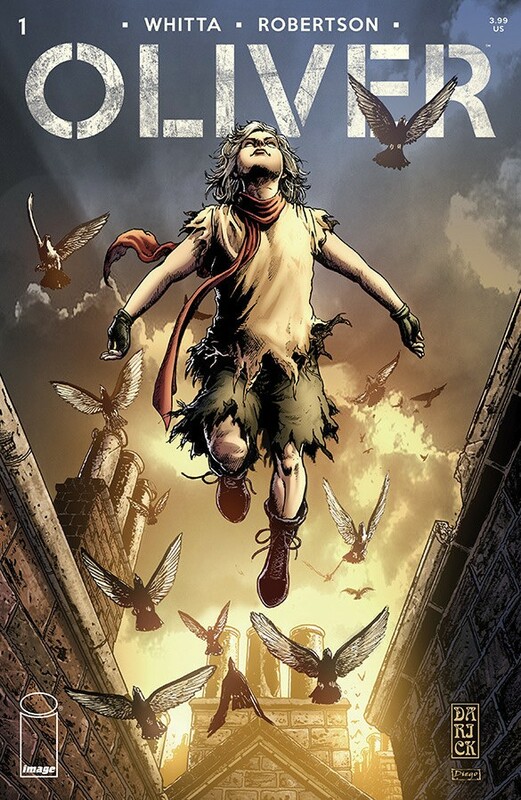 Robertson, who previously penciled Transmetropolitan, Happy!, and The Boys, looked both to the past and the future for inspiration—from archival photos of post-blitz London and film versions of Oliver Twist by David Lean and Roman Polanski, to futuristic comics like Akira, V for Vendetta, and comics published by 2000 A.D. Some of the pages, sprawling and stunning in their detail, call to mind classic art by horror pioneer Bernie Wrightson, which is no coincidence. “His early Frankenstein work was what I was thinking of,” Robertson explains. “What Wrightson does in those illustrations, with a genius use of negative space, is staggering. I wouldn't dare to compare my work to his, but yes, when I see that, I'm inspired.” Though he does admit to the occasional “brick fatigue,” Robertson describes his detailed style as more of a compulsion to work the page until it feels finished. This world, both old and modern, is vastly different from some of Robertson’s past expressions of futurism, like his collaboration with writer Warren Ellis on Transmetropolitan, which was bustling and frenetic. 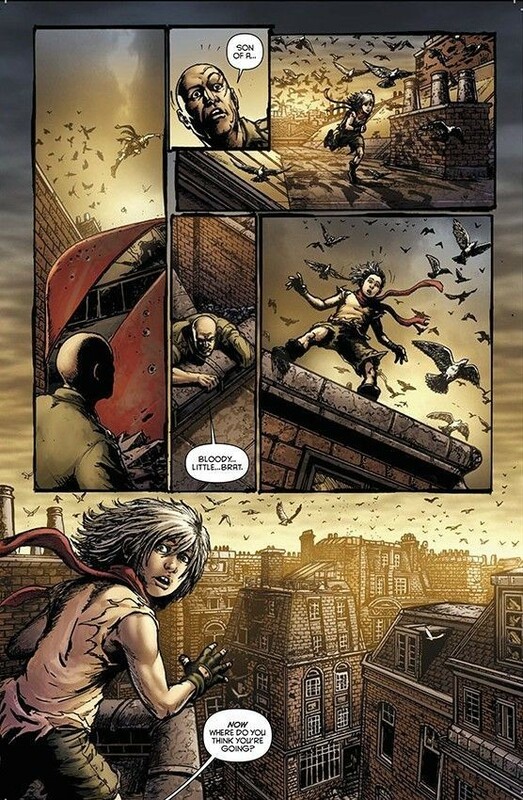 “Transmet was a thriving world that was in confusion and chaos, but fully functioning. Oliver's world is what's left after humans have made every mistake possible,” he says. The dissonant place of humanity in this world also shines through due to one of Robertson’s more prominent visual motifs: pigeons. They flock and swoop around the sky, thriving amid the devastation. While they serve as a strong visual metaphor—for nature, freedom, unity—they also bring life and dynamism to the dead city. “While everything is irradiated, I imagine pigeons will withstand it and keep on going, as they are incredibly tough birds who already manage to thrive to the point of nuisance in big cities,” he says. 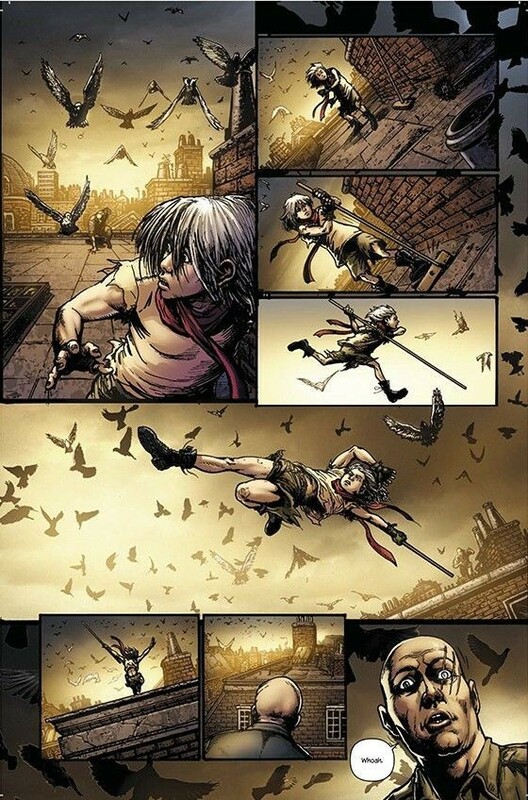 In Oliver’s case, that question concerns his identity, a mystery throughout the early issues, but it’s his quest for answers that will have him crossing paths with new interpretations of classic characters like the exploitive Fagin and expert pickpocket the Artful Dodger—albeit, under a dark veneer that reflects the current political and environmental upheaval outside (and behind) our front doors. The comic doubles as a coming-of-age story and a superhero tale, or even social commentary about life on the margins of society, but Oliver is still an exercise in escapism. Like any good piece of dystopian fiction, it holds a mirror up to our flaws but still offers a path to salvation. Oliver #1 is available in comic book shops on January 23rd, 2019. I want to imply that change is coming to a world where oppressed people are used to looking down; Oliver makes them look up.